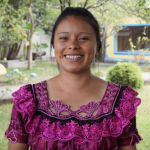 Teodora, a teacher of Intercultural Bilingual Primary Education, is originally from the Canton Xatún, Paraje Xek’axtun village of the Chuatroj Department of Totonicapa, Guatemala. She was selected as a GOJoven Fellow when she was 25 years old. Teodora is an enthusiastic leader and a nonconformist. Currently, she volunteers at the OSAR Reproductive Health Observatory.